You have already decided on it: you are coming to visit Toledo, the city of three cultures declared a World Heritage Site by UNESCO. Come and listen to its stories and walk on the same streets as El Greco, Garcilaso de la Vega and Gustavo Adolfo Bécquer. The question is: where are you going to stay? Of all the hotels in Toledo, which one will you choose? Toledo is the perfect size to discover entirely on foot, which is why we recommend that you stay in a hotel in the city centre. Let a professional guide tell you the city’s most thrilling legends and stories and take you to all those places you simply have to see. When you go back to the hotel after an intense day of sightseeing in the city, relaxing in common areas is an added plus. We are next to the Alcázar, in a quiet area within walking distance from all the main points of interest, just 3 minutes away on foot from the historical Plaza Zocodover. Only for bookings made on this website. The official guides will make sure you learn everything you need to know about the real and authentic Toledo. You can choose from three different tours. After a long day of sightseeing, you can return to the hotel and relax on our fantastic chill-out terrace located on the fifth floor. 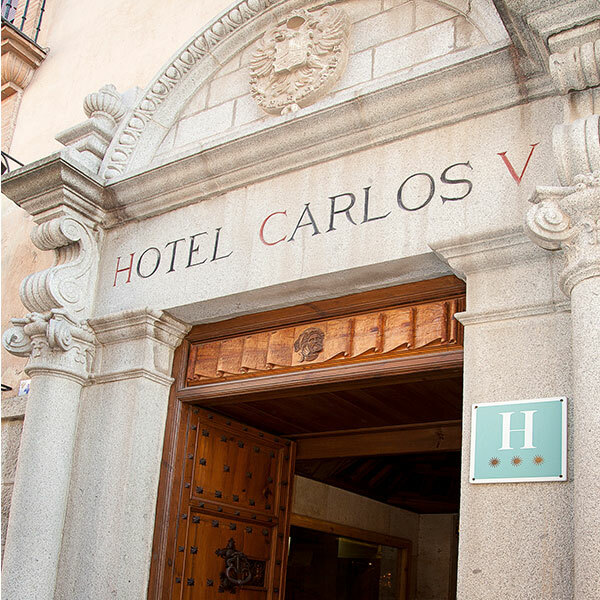 Hotel Carlos V is the oldest operating hotel in the city. The hotel opened its doors in 1947 and today, despite having adapted to modern times, still preserves a charming atmosphere in all its rooms and common areas. The Rojas Theatre is located a stone’s throw from the hotel entrance, which is why we have a wing reserved especially for the actors and actresses who regularly perform there. Our hotel has also hosted illustrious guests such as Catherine Deneuve, Rita Hayworth, Fernando Fernán Gómez, Emma Cohen, Arturo Fernández and a very young Johnny Depp among others. If you find our rooms cheaper elsewhere, let us know and we will give you an even bigger discount. By the way, have you checked out our offers yet? Enjoy a free private tour of your choice just by booking on here. There will be nothing you haven’t seen or learned about after your tour around Toledo! Book now and don’t pay until you get to the hotel. Also, manage your booking directly with us, without intermediaries. However, this is only for bookings made on our official website. We already said that we have the best online price, that you get a free private tour by booking on our website and that you don’t have to pay anything until you get to the hotel. Also, that we are located in the heart of Toledo’s old town and that we are eagerly awaiting your arrival. If you are still not convinced, we have another ace up our sleeve: our offers. Discover offers with better conditions than those you have already seen right here. What will you find when you arrive at our hotel in Toledo? Single, Double, Triple, with Jacuzzi, with views of the city… Check out our rooms and choose your favourite. They are all renovated and have a modern decoration. Every morning, we serve a breakfast buffet in our Mudejar-style restaurant. Having breakfast under a ceiling like this is not within everyone’s reach. Quite simply, the best way to start the day! If you are coming to Toledo by car, you can park it in the car parks with surveillance located just 200 yards from Hotel Carlos V. Also, just for being a hotel client, you get the special price of 15 euros per day. Three overlapping cultures. Neighbourhoods full of charm, contrasts, history and legends. Convents, churches and monasteries to remember. An exquisite cuisine. A city with a special past, so much so that it was declared a World Heritage Site. All in all, Toledo is unique. We want the city to surprise you and, for that, you can count on us. The hotel itself is beautiful. The rooms are fully equipped, very clean and spacious. The staff were very friendly and the breakfast was delicious and complete. Everything was fantastic. I particularly liked the minibar in the room, the terrace, the breakfast (the room and the churros above all) and, of course, the guided tour with Sara. Also, the location was excellent. We liked it all. Everything. Cleanliness, atmosphere, location, service, attention from the staff… Everything was great. Central location with easy parking, comfortable room, good firm bed, large breakfast selection and friendly staff.